We know that hunger exists on campus and many students don’t know where to turn to access healthy foods. A UW-Parkside campus study on student hunger found that 93% of students responded that they did not know where to receive food assistance on campus. Whether you are a student ally, friend or educator, the resources below can help you be an advocate on campus to connect students to food and benefits they need to work, learn, play and live healthy lives. If you would like to request printed copies of the half-sheet flyers or tabbed posters to distribute and post on campus, please email sdorfman@feedingwi.org with the specific quantities you would like and a mailing address. Does your college post electronic notifications on TV screens around campus? Encourage your campus to add this slide to provide students with information on accessing food resources. It’s hard to study when you are hungry. Feeding Wisconsin is working to end campus hunger. 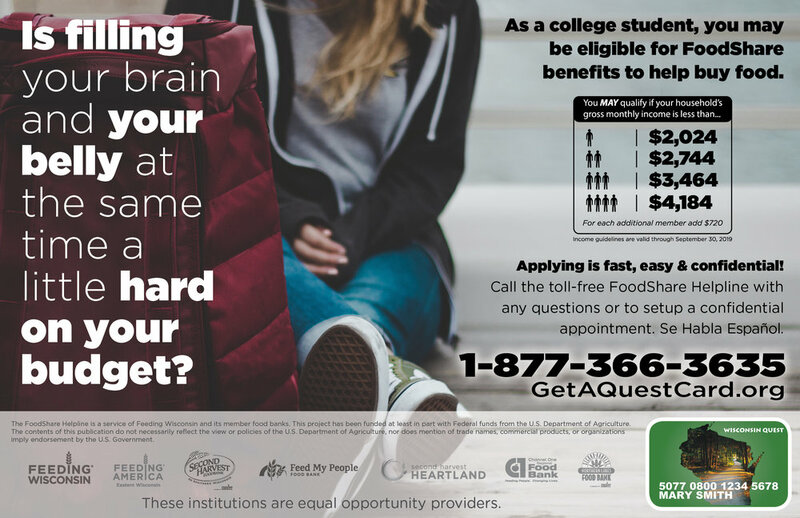 Join us by going to www.getaquestcard.org/collegehunger. Access a campus hunger toolkit to take action on your campus. This presentation discussed the scope of campus hunger, provided resources to share with students experiencing hunger, presented a toolkit to help decrease the SNAP/FoodShare gap among students on your campus, and provided information about Feeding Wisconsin’s FoodShare Outreach services and student eligibility requirements for FoodShare. Click to the left to watch the webinar here or click here to view full screen. Are you a campus staff member or fellow student who is looking for more information and ways to talk about hunger resources to other students? Want to know ways of breaking down myths and stigma and provide information that empowers individuals to access the food that they need to live and learn well? Feeding Wisconsin and its member food banks partner with local food pantries and meal programs to distribute food and to implement programming end hunger. There are many ways that you can partner to connect more individuals to resources they need. Perhaps you are interested in starting a campus food pantry or having food bank staff present to college students to increase awareness of the issue of hunger.